There are tons of books that would be perfect for a Halloween review, but that would involve far more work than sharing the Lemony Snicket inspired song "Scream and Run Away." Happy Halloween, everyone. Stay safe out there, especially my New Jersey and New York friends. 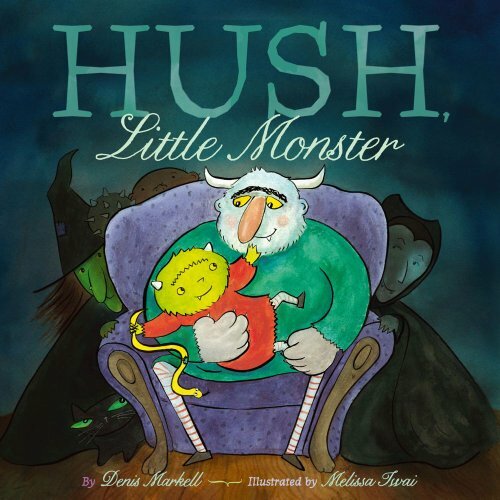 "Hush, Little Monster, don't you howl. Daddy's gonna give you a screeching owl. If that owl won't say 'whoooo,' Granny Ghost will bring you a big, bad boo!" Silly version of the song with lots of monster visitors, but the bright colors and cartoon style keep it all in fun. Some slightly spooky pages with zombies, but also silly situations like an ogre sneezing from all the hair shed by the wolf man. Light fun for Halloween or any time of year. 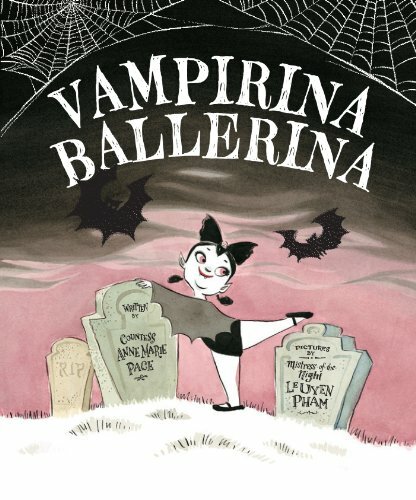 A vampire girl who wants to be a ballerina is faced with unique challenges. Finding a night class is hard enough, but how do get the perfect positions when you can't see yourself in a mirror? Of course then there is the question of fitting in. But this little ballerina keeps at it with family support and it all turns out fine. The talented LeUyen Pham lends her special style in the illustrations with lightness and humor. Fun for the whole family, but especially the ballerinas. 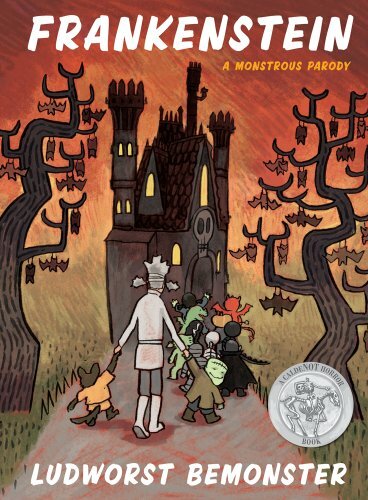 “In a creepy old castle all covered with spines lived twelve ugly monsters in two crooked lines.” For Madeline fans, I need go no further to explain the shear enjoyment of this book. With the rhythm and set up of the original, this book copies the illustration style. though it’s hard to compare the gentle Madeline with the little monsters who inhabit the castle – even if they are some cute little monsters. Though not well-behaved ones. “In two crooked lines, they bonked their heads, pulled out their teeth, and wet their beds.” The book takes a dark turn with Frankenstein loses his head, goes to the hospital and starts eating people. And the book ends with all the monsters headless. It’s done in fun and with a silly feel, but it might be worth knowing before, say, you read the book to a room of preschoolers. Probably a better bet for k- 2nd grade. But very well done. Today is the last day to nominate a book for the Cybils awards, so head over there and make sure that your favorite children and teen books of the year are listed. For some ideas, check out Cybils "wish list" posts around the Interwebs, including a selection at the Cybils. Also you can feel a little generous by donating a book in the Ballou book fair. There are lots of great choices to help this underfunded D.C. high school, and we are making a difference - book by book! I have a lot of chores to do today, so let's get right to the book. 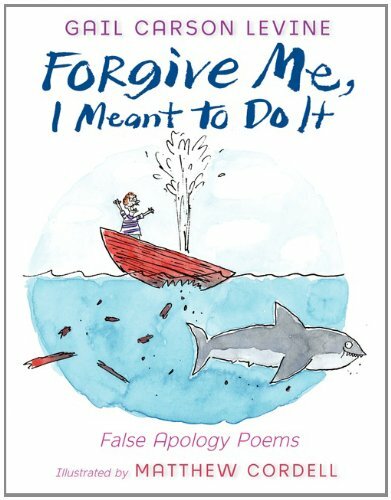 Find more Poetry Friday selections with our host Teaching Young Writers. Also, don't forget to get in your Cybils nominations which are coming to a close (checking calendar....) on Monday, and consider sending a book to Ballou (which sounds like a Seuss village) the fall book drive which ends on Sunday. Go Nationals! Traveling light, I left for New York City with a purse and an ingeniously packed laptop bag containing a change of clothes, toiletries, and an iPad that I barely know how to use. 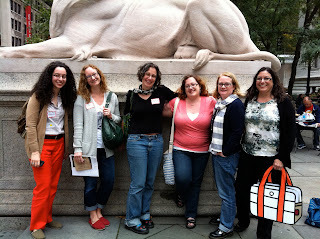 I came back from KidLitCon 2012 with much, much more including fifteen ARC's, ten hardbacks, five F&G's, four tote bags, three notebooks, two mini-shampoos, and a Ganesha's Sweet Tooth toothbrush. Of course, I also came back with great memories, new friends, and a fresh perspective. And I have a representative photograph of that... which I took from Kelly at Stacked. I took the bus in on Friday and missed the first session of publisher previews, but did get to have lunch with old friends Liz Burns and Kelly Jensen. I was particularly excited to meet another longtime blogger friend in actual real life, Leila from Bookshelves of Doom. Then it was off to Penguin, where I was unfortunately late for guest authorGayle Forman, but was treated to a preview of upcoming titles. 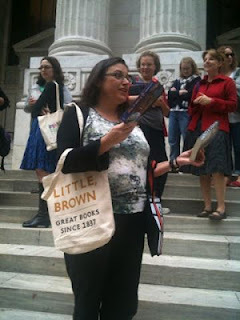 I loved the the enthusiasm displayed each editor for the books coming out of their division and was excited to bring home a bag of some of the talked about titles. The marketing department shared their thoughts and book trailers as we munched on cupcakes, and the art department gave a very interesting presentation on book covers and how they come to be. After talking to a few other bloggers, I headed to the hotel room that I shared with Liz and Kelly, where I met up with Lelia and her charming friend Amanda, and we all traded books from our various previews. Reviewing middle-grade and picture books like I do, I got more books than I could take home, but I also gave away most of my YA titles. Of course the real treat was her presentation of her journey as an artist. It was personal and meaningful, exploring her revelation to find her own style by looking to what moved her and incorporating her cultural and individual identity. The lovely talk was followed by a signing of her new book, Starry River of the Sky. The day was over before the karaoke could begin, though some of us stopped at the bar on the way back home. (Yeah, I'm looking at you, Maureen.) We closed the night pretty early though, saving our energy for the upcoming big event: KidLitCon. Nominations for the Cybils begins today. This is happening, people! 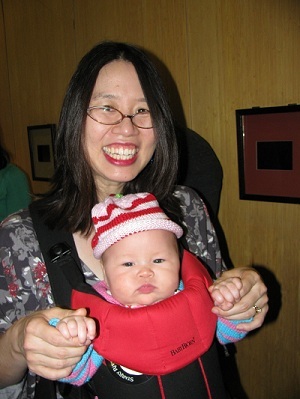 Any English or bilingual books published in the U.S. or Canada between the end of one contest and start of another. For 2012, that means books released between Oct. 16, 2011 and Oct. 15, 2012. Books must be specifically published for the children’s or young adult market. So get over there and nominate the books that we need to see. It's Cybils time!